NGL Energy partners, based in Tulsa, Oklahoma, is purchasing Crescent Terminals LLC and its interests in Cierra Marine LP. The terminal facility adds 130,000 barrels of storage capacity and throughput capacity of 20,000 b/d. Cierra Marine's assets include four tow boats and seven crude oil barges. The deal roughly doubles the size of NGL Energy Partner's fleet of marine equipment. The deal adds to the company's ability to service the inter-coastal waterways. 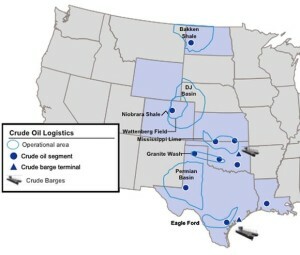 NGL Energy Partners already operates the Rio Hondo Terminal and the Texas Intercoastal Marine Terminal.